The coastal plain of South Carolina is home to mysterious geological formations known as Carolina Bays, though they also occur elsewhere along the east coast. The bays are elliptical-shaped depressions that possess diverse ecosystems, depending on their depth, size, elevation, and other factors. Though the bays’ origins are not determined, many scientists believe they were caused by limestone sinkholes, with wind patterns moving water within the depressions and creating their shape. Not only can visitors see these fascinating formations at Woods Bay State Park in Olanta, but they can witness some of the largest remaining Carolina Bays along the Atlantic seaboard. 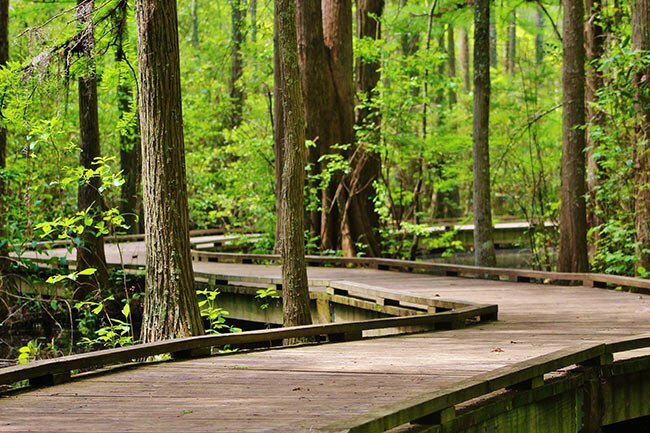 The park encompasses 1,590 acres of ecological diversity, including sandhills, marshes, and evergreen shrub bogs. 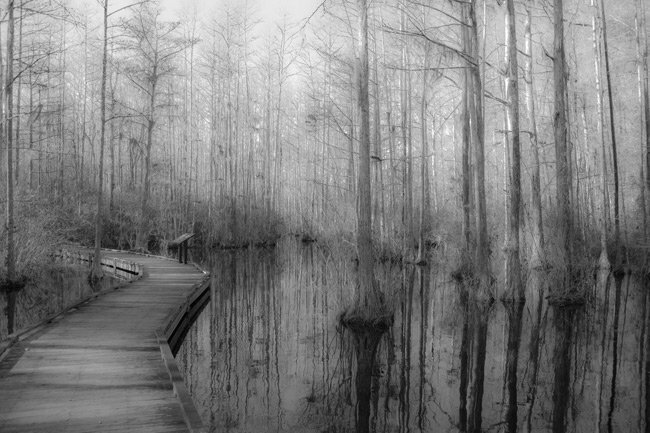 A boardwalk winds 1,150 feet through a cypress swamp, and canoeing, kayaking, and fishing are allowed within this gem of a state park. In fact, the park claims that the best way to experience the Carolina Bays at Woods Bay State Park is to paddle alongside them. 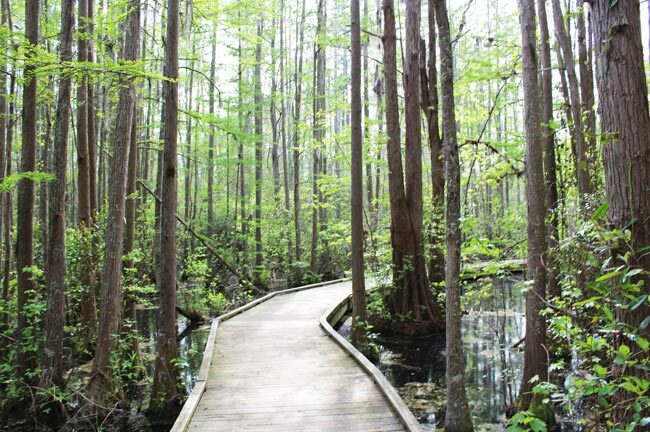 A nature trail takes visitors three-quarters of a mile around a mill pond where two grist mills and a cotton gin once operated. The brick foundation of one of the mill structures remains visible. Underground springs supply the bays with water, and several species of endangered plants and animals thrive within the park. 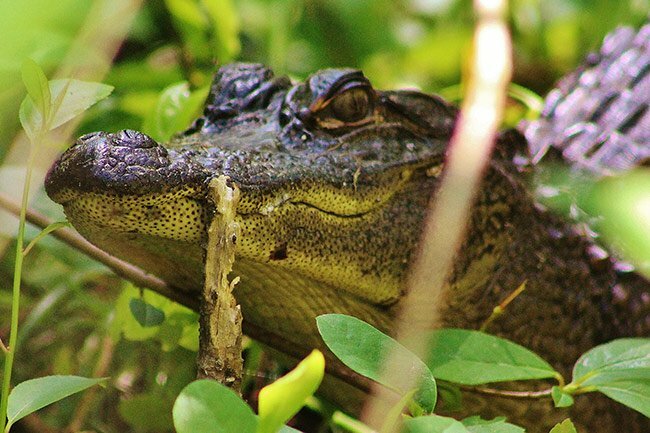 American alligators are commonly spotted in the park, as the reptiles have found the perfect habitat of large, open waters teeming with food in the swamp and mill pond. 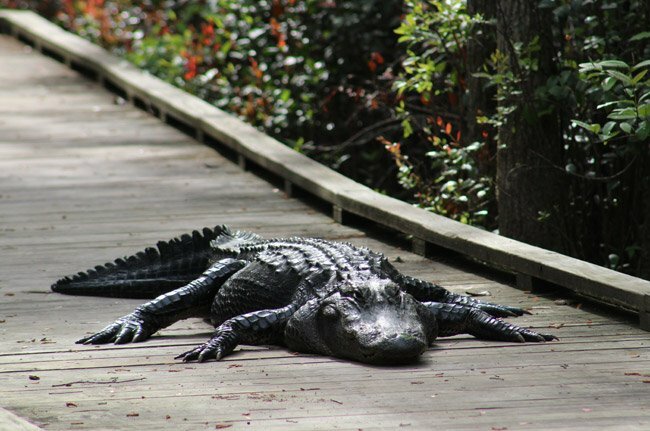 Despite the below photo, alligators are typically viewed in the water from the boardwalk rather than on the boardwalk itself. Birding is a popular activity at Woods Bay State Park, with 81 bird species documented within the park to date. 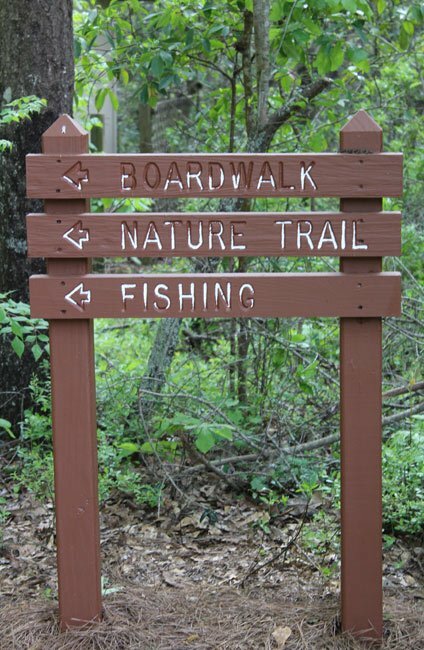 Picnic shelters are also available, making Woods Bay the perfect day trip destination for lovers of the outdoors. The property was acquired by the state for use as a park in 1973.